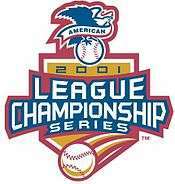 The 2001 American League Championship Series (ALCS) was a rematch of the 2000 ALCS between the New York Yankees, who had come off a dramatic comeback against the Oakland Athletics in the Division Series after being down two games to zero, and the Seattle Mariners, who had won their Division Series against the Cleveland Indians in five games. The series had additional poignancy, coming immediately after downtown New York City was devastated by the events of September 11, 2001. (The series was played in late October due to Major League Baseball temporarily shutting down in the wake of the attacks). Though the Mariners had won an American League record 116 regular season games (tying the major league record established by the 1906 Chicago Cubs), and had home field advantage, the Yankees proved overpowering as they won the first two games in Seattle. The Mariners' manager, former Yankee player and manager Lou Piniella, guaranteed after Game 2 that the Mariners would win at least two of the next three games in New York to return the series to Seattle. However, the Yankees closed out the series in New York, beating the Mariners four games to one. The series ended with a 12–3 Yankees victory in Game 5. Game 1’s starting date was the latest ever for a League Championship series. The Yankees took a 1–0 lead on a Chuck Knoblauch single that scored Jorge Posada in the second, then increased it to 3–0 on a Paul O'Neill home run in the fourth. The Mariners got on the board on a John Olerud groundout that scored Edgar Martínez in the fifth. The score remained 3–1 until the ninth when the Yankees increased their lead to 4–1 on a David Justice single that scored Alfonso Soriano. The Mariners got that run back in the bottom of the inning when Mariano Rivera threw a wild pitch to Bret Boone that scored Ichiro Suzuki, but Rivera retired Boone and the next batter, Edgar Martínez, to end the game. In Game 2, the Yankees took a 2–0 lead in the second against Freddy García on a Scott Brosius double that scored Tino Martinez and Jorge Posada. Brosius would then score on a Chuck Knoblauch single two batters later to make it 3–0 Yankees. The Mariners responded in the fourth on a two-run home run from Stan Javier off of Mike Mussina to make it a one-run game. However, neither team would score afterwards and the Yankees took a 2–0 series lead heading to New York City. The Yankees were poised to go up 3–0 in the series after Game 3, jumping to a 2–0 lead in the first on a Bernie Williams home run off of Jamie Moyer. However, they would not be able to score again until the eighth on a David Justice single. Orlando Hernández pitched four shutout innings before giving up a game-tying two-run single to Bret Boone in the fifth. The Mariners then scored seven runs in the sixth capped by home runs by Boone and John Olerud to take a 9–2 lead. They would not look back, scoring five more runs in the next three innings, including a Jay Buhner home run in the ninth, off of three Yankee relievers to cruise to a 14–3 win and guarantee a Game 5. Game 4 remained scoreless until Bret Boone hit a home run off Yankees reliever Ramiro Mendoza in the top of the eighth to give the Mariners a 1–0 lead, but the Yankees responded in the bottom of the inning with a Bernie Williams home run off Arthur Rhodes to tie the game. Mariano Rivera pitched a scoreless ninth and the Yankees won the game 3–1 in the bottom of the inning on an Alfonso Soriano two-run home run off Kazuhiro Sasaki to take a 3–1 series lead. In the bottom of the third inning of Game 5, an error by Mariner third basemen David Bell resulted in the Yankees scoring four unearned runs, including a two-run home run by Bernie Williams, off Aaron Sele. Paul O'Neill homered in the fourth to put the Yankees on top 5–0. They would break the game open with four runs in the sixth, making the score 9–0. The Mariners got their only three runs of the game in the seventh on back-to-back singles by Bell and Ichiro Suzuki off Andy Pettitte. In the bottom of the eighth, Tino Martinez hit a three-run home run as the Yankees cruised to a 12–3 win and advance to the World Series for the fourth straight year. Soriano into deep right, Ichiro back, at the wall...Yankees win! — FOX Sports Joe Buck calling Alfonso Soriano's dramatic walk-off home run in Game 4. Before you guys start asking questions let me start by saying We’re gonna be back here (Seattle) for Game 6, I told the people out there the same thing, I guarantee you we will be back here for Game 6. — A furious Mariners’ manager Lou Piniella at the press conference room after Game 2 loss to the Yankees in Seattle. The Yankees’ streak of consecutive World Series wins ended at three, as they fell to the Arizona Diamondbacks in the World Series in seven games. They would make the World Series again in 2003, but they lost to the underdog Florida Marlins. The Yankees would not win another World Series until 2009. To date, the Mariners have not made the MLB postseason since 2001. Still, their 116 wins in the regular season remain tied (with the 1906 Cubs) for the Major League record. No team has approached 116 since, with the closest being the St. Louis Cardinals in 2004 when they won 105 games. ↑ "2001 ALCS Game 1 - New York Yankees vs. Seattle Mariners". Retrosheet. Retrieved September 13, 2009. ↑ "2001 ALCS Game 2 - New York Yankees vs. Seattle Mariners". Retrosheet. Retrieved September 13, 2009. ↑ "2001 ALCS Game 3 - Seattle Mariners vs. New York Yankees". Retrosheet. Retrieved September 13, 2009. ↑ "2001 ALCS Game 4 - Seattle Mariners vs. New York Yankees". Retrosheet. Retrieved September 13, 2009. ↑ "2001 ALCS Game 5 - Seattle Mariners vs. New York Yankees". Retrosheet. Retrieved September 13, 2009.